Wisconsin Democratic congressional candidate Randy Bryce was originally scheduled to attend a celebrity studded fundraiser at the home of liberal actor Sean Penn in Malibu, California later this month, but after briefly denying the existence of the fundraiser, the campaign said the event had been canceled. Bryce, who is vying for House Speaker Paul Ryan's (R., Wis.) open seat in the 1st Congressional District, originally sent out an invitation for the fundraiser in early September. The invitation listed actors Mark Ruffalo and Bradley Whitford, comedienne Chelsea Handler, and Rep. Ted Lieu (D., Calif.) as hosts on the invitation, according to the Daily Caller. In addition to some of the names listed on the host committee, the invitation listed the sponsorship levels for donors to attend, including $10,000 to be a chair, $5,000 to be a co-host, and $2,700 to be a guest. Bryce has publicly admitted his campaign would reach out to New York and California for support because "that's where a lot of money comes in from," but the fundraiser with Penn was not to be. Penn is known for his leftist political activism, but his relationship with late Venezuelan dictator Hugo Chavez has drawn criticism since he first met with the socialist leader in August 2007. The actor met with Chavez multiple times, even referring to the dictator as a "friend I was blessed to have" when he passed away in 2013. "Today the people of the United States lost a friend it never knew it had. And poor people around the world lost a champion," Penn said in a statement, according to the Guardian. "My thoughts are with the family of President Chavez and the people of Venezuela." During a 2008 interview with David Letterman, Penn defended Chavez’s decision to shut down a popular television station in 2007. "Since 1998, they had been encouraging the assassination of Chavez every day on that channel, something they would have gone to prison for here," Penn said. "He just didn’t reup that license. Meanwhile, the idea that there’s no freedom of expression — I mean the loons on Fox News are broadcast there every day." The actor’s comments regarding Chavez’s successor, Nicolas Maduro, have also not aged well: "Venezuela and its revolution will endure under the proven leadership of vice president Maduro," Penn said in 2013. Ruffalo, an actor and filmmaker, has also made controversial statements as a 9/11 conspiracy theorist, and he tweeted last June that MSNBC and NBC should "stop the white conservative hiring spree." The Daily Caller News Foundation reached out to Bryce's campaign about the fundraiser and Penn's controversial statements, prompting the campaign to deny the fundraiser's existance. "There is no fundraiser on the 29, so he is not participating because this fundraiser does not exist," said Julia Savel, Bryce’s communications director. When the Daily Caller followed up with clarification, including a picture of the invitation, Savel responded by saying the event "has since been cancelled." In addition to defending Chavez, Penn made controversial comments recently about the #MeToo movement, which emerged last October after media reports revealed several allegations of sexual assault and harassment against Hollywood producer Harvey Weinstein and other powerful men in the media, politics, and Hollywood. In an interview with NBC, Penn said the movement "divides men and women." "I don't want it to be a trend and I'm very suspicious of a movement that gets glommed onto in great stridency and rage and without nuance," Penn said. "I think it's too black and white. In most things that are very important it's really good to just slow down." Bryce has repeatedly said his campaign stands behind women. The Democratic candidate will face Republican candidate Bryan Steil, who announced his candidacy after Ryan's decision to retire at the end of his current term, on the ballot in November. Steil's spokesman, Andrew Iverson, slammed Bryce for his relationships with "out-of-touch celebrities." "Over 90 percent of Randy Bryce’s campaign has been funded by out of state liberals, so it’s no surprise that he planned to jet to California and rub elbows with out-of-touch celebrities," Iverson said. 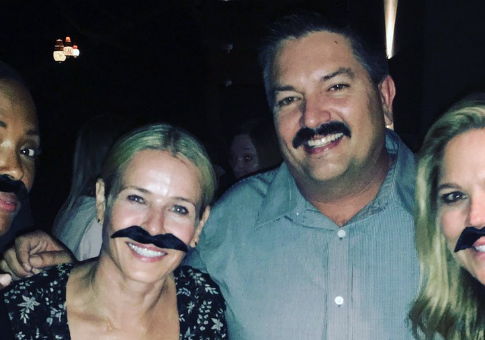 "Randy Bryce continues to show that his far-left policies are too extreme for Southeast Wisconsin." This entry was posted in Politics and tagged 2018 Election, Hollywood, Hugo Chavez, Paul Ryan, Randy Bryce, Venezuela, Wisconsin. Bookmark the permalink.